Caleb, Corbin and Carson want to help raise money to bring Cadence home! Is that enough "C" names? 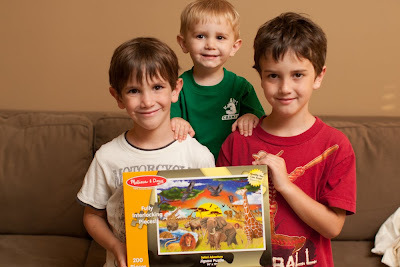 They have picked out a puzzle to put together but need your help with the pieces. They can't start putting it together until pieces have been sponsored. We are asking for a minimum donation of $10 per piece. We will put the names of those who sponsor a piece on the back and once the puzzle is complete Cadence will be able to see who played a part in bringing her to her forever home. You can donate using the button on the right side of the page and make sure to make a note that it's for the puzzle. We really appreciate your support! Garage Sale Success and Other Exciting News!